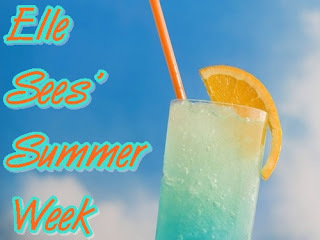 I had so much stuff to cover & so much fun, that I'm extending Summer Week! This week I'll have a Quick Tip, Summer Makeup, Month of Hair Masques #2, Summer Feet & Hair Care, and Summer Cocktails ! One tip that I share most often is this one. Aloe vera is good, but just never worked well for me, so when I saw this tip on Lifehacker, I had to try it. And it works! I constantly read on Twitter how some of your lovelies got sunburned and are miserable. Well, say Sayonara to Sunburn because Elle Sees has the solution! This tip works best if you can use it as soon as you notice a burn. Get 1-2 black tea bags and steep them. Pour tea into a pitcher. Add more water if you have lots of burns. Depending on the area that needs to be covered, use an old washcloth (it could get stained) or dishtowel. Put the towel(s) into the pitcher and allow them to soak. Make sure the tea/towels have cooled down, squeeze excess tea, and then apply to burns. Resoak & reapply often, preferably overnight. The burn should be gone by morning if you soak them long enough. *Bonus tip, I've heard the same thing will work for regular milk (or buttermilk) but I've never tried it. What do you use for sunburn remedies? Oh, THANK YOU for the tips! I just got burnt last week! What a fabulous tip! i havent even been able to lay out yet its so depressing! this is awesome! as someone with seriously pale skin, i can definitely put this to good use! That sounds great! Now if I actually had time to go out in the sun... ;) Cute blog! Smart lady, thanks for the tip! My pale self always gets burned if I'm not careful. This is such an easy remedy! This made me want to make some ice tea and I don't even have a sunburn....it just looks soooo good! I know people that have aloe vera plants and use bits of it on their sunburn. I will definitely remember this for summer! I burn soooooo easy.